TripsCommerce is an online travel business management automation solution offered as a SaaS and designed to simplify travel sales. The software is more geared towards time-based travel products and is a perfect platform for travel agencies and booking firms. Aside from offering businesses with their own booking and payment website, TripsCommerce also enables companies to create their own travel marketplace where other users can upload and showcase their inventory and collect payments. TripsCommerce provides users with a plethora of website themes that they can tailor to suit their corporate branding and cloud-based guest relations and operations management capability. With TripsCommerce, users are able to process payments, automate reservations, and manage online bookings with ease and unparalleled efficiency. TripsCommerce makes it easy for travel agencies, booking firms, and other similar businesses to create a branded website without having to spend effort and/or money on designers and programmers. The software is built with its own website theme builder that gives users total control over their website’s feel and look. All website themes are built specifically to cater to the travel industry’s requirements and best practices. That means you only have to pick a theme and start your website almost immediately. Customization options are available so you can modify your website’s configurations to match your business needs and preferences. 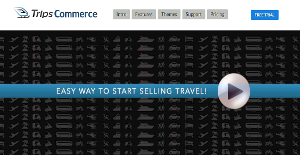 TripsCommerce simplifies content management with its full CMS and blogging functionality. Its CMS is very friendly even to novice users, allowing them to fully maximize their content publishing and management capabilities and easily update their websites from a single, unified admin interface. Packaging and selling your travel products is a breeze. The software is loaded with a throng of inventory management tools that allow them to be on top of their products and services – accommodation, rentals, cruises, charter and transfer services among others. Want to create travel promos? Automate travel inventory and payment collection? You can’t go wrong with TripsCommerce. The software is optimized for smartphones and tablets, with each theme built with an integrated shopping cart. That means your customers can check your website from their mobile devices and easily purchase your travel products from the palm of their hands. What Problems Will TripsCommerce Solve? TripsCommerce simplifies the technology for small tourism operators, accommodation providers, and BnB owners by providing end to end solution for centralized bookings, distribution, and operation management. If you are considering TripsCommerce it may also be beneficial to examine other subcategories of Best Business Process Management Software collected in our database of SaaS software reviews. Since each company has unique business requirements, it is advisable for them to refrain from looking for a one-size-fits-all faultless software system. Needless to say, it would be useless to try to find such a system even among market-leading software solutions. The smart thing to do would be to list the various important aspects that need consideration such as key features, budget, skill levels of staff members, company size etc. Then, you should do your research thoroughly. Read some TripsCommerce reviews and check out each of the other systems in your shortlist in detail. Such exhaustive research can make sure you weed out ill-fitting systems and zero in on the solution that provides all the features you need for business success. How Much Does TripsCommerce Cost? We realize that when you make a decision to buy Business Process Management Software it’s important not only to see how experts evaluate it in their reviews, but also to find out if the real people and companies that buy it are actually satisfied with the product. That’s why we’ve created our behavior-based Customer Satisfaction Algorithm™ that gathers customer reviews, comments and TripsCommerce reviews across a wide range of social media sites. The data is then presented in an easy to digest form showing how many people had positive and negative experience with TripsCommerce. With that information at hand you should be equipped to make an informed buying decision that you won’t regret. What are TripsCommerce pricing details? What integrations are available for TripsCommerce? If you need more information about TripsCommerce or you simply have a question let us know what you need and we’ll forward your request directly to the vendor.